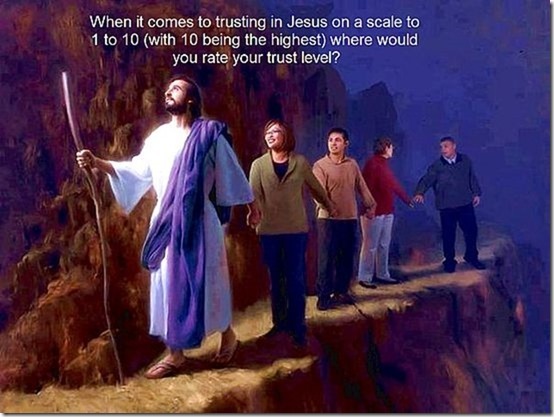 When it comes to trusting in God on a scale to 1 to 10 (with 10 being the highest) where would you rate your trust level? What follows is a little test for you to take to check your trust level. He must have been ready for me because there was no hesitation, “There is no power in what you believe. In fact many times faith contradicts belief. See that river out there,” he asked? I wasn’t ready to answer him because I believed if I tried I’d drown yet with him at my side I knew could. After a few minutes of internal struggling I said, “Without you I believe I would drown but with you by my side I know I could.” I felt pretty confident about my answer or at least I was but all that changed with his next question. “Want to go for a walk?” he asked. He had me! Suddenly I felt the power of my beliefs once rock solid fly right out the window. I faced many confrontations in my life but this put the icing on the cake. “The cat got your tongue,” he asked me with a big grin on his face. “The cat don’t have it you do,” I echoed in return. Silence again filled the car. “I can’t do it without you,” I quickly answered. “Were you with me on the cross? In the tomb?” he asked. “No,” I quickly replied! “Who was then?” he replied. “God?” I asked. “God doesn’t have a body so he couldn’t hang on cross and he’s eternal so he can’t die,” he answered back. “Well his Spirit was with you then,” I said. “So get out of the car walk to the river’s edge jump and walk to Canada my Spirit will be with you,” he was wearing that grin again.